If the experience of riding your Chevy Silverado has become similar to that of riding a roller coaster, then it is time to upgrade your vehicle’s suspension system in the form of new shocks. New shocks can improve the ride quality of your Chevy more than anything else can. But which are the best replacement shocks for Chevy Silverado? We have shortlisted the top 4 shock absorbers for both front and rear tires to help you find a product that is not only affordable but reliable also. 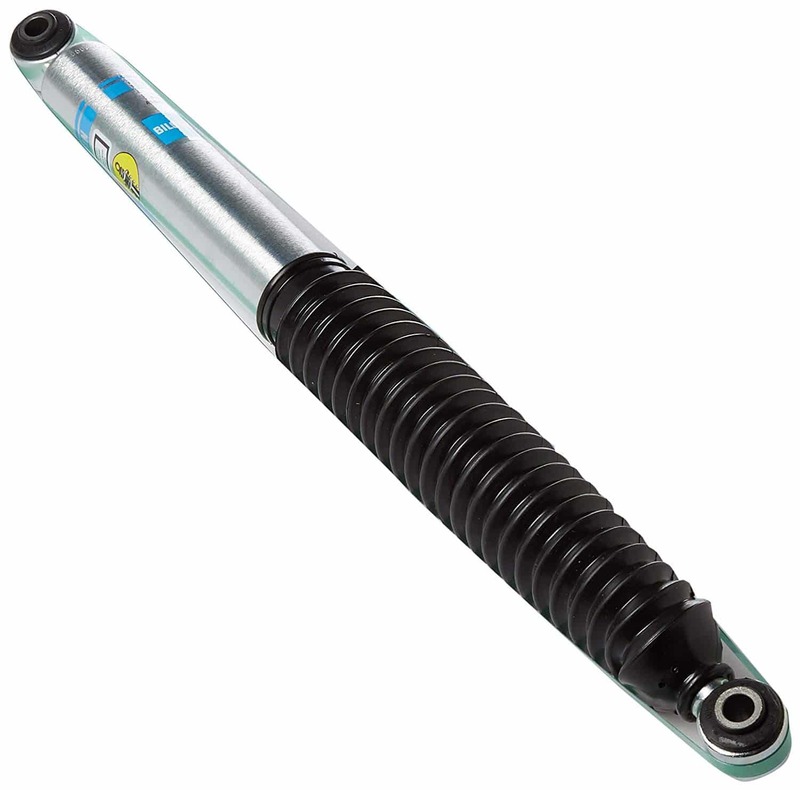 The Bilstein 33-238319 rear shock absorber from the 5100 series features a self-adjusting disc valve system, monotube gas pressure construction, and extra durability because of zinc finish. They provide additional off-road support and also help maintain a consistent ride on streets and highways thus making these shocks the best replacement shock for your Chevy Silverado. Able to Bear Increased Side Loads – These shock absorbers are designed in such a manner that the rod is positioned into the strut tube thus helping them to withstand side loads like a pro. Installation of these shock absorbers increases the surface and diameter of the pressure tube thus enabling your Chevy Silverado to bear additional heavy side loads easily. Better Rebound – whenever the vehicle hits an obstacle or a bump the piston head provides better rebound damping. You can enjoy a smoother ride as the force is absorbed by the shock. Stops Foaming – In case of a heat build-up, the oil heat is passed to the outer surface of the shock. This allows the oil to expand to avoid foaming and the loss of viscosity. This ensures that these shocks work well even when the Chevy is hot. 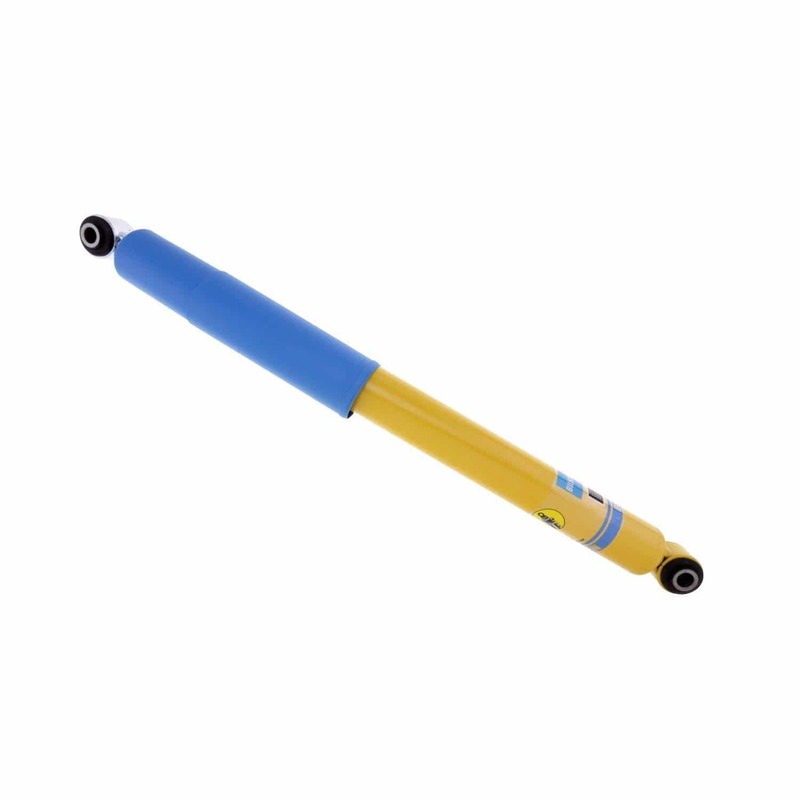 Monotube Technology – The Bilstein 24238304 uses a 46 mm wear resistant monotube. This monotube helps to ensure a balanced ride by moving up and down on a bumpy road. 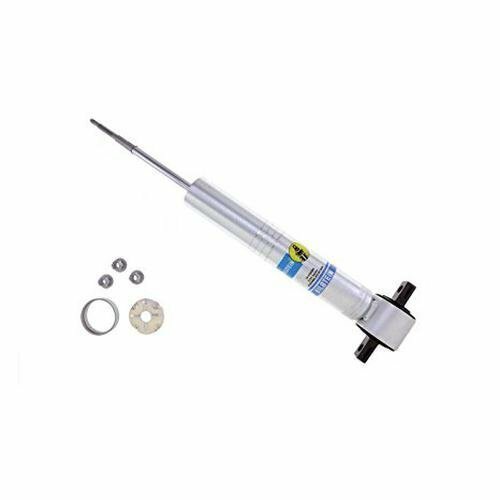 The Bilstein 24238304 front shock absorbers from the B8 5100 series are designed for vehicles that feature a front OE coilover style suspension. Snap Ring Grooves – The multiple snap-ring grooves can be adjusted to different spring seat positions thus providing a 2.75-inch front lift. Monotube Design –The 46 mm monotube helps to ensure fade-free and consistent performance in all driving conditions. The patented digressive valves react instantly to inconsistent surfaces to warrant a smooth ride. High Quality Material – These shocks are made by incorporating the latest technologies with high quality and durable metal to make sure that they serve you for a long period of time. Enhanced seating position guarantees comfort even on harsh terrains. These shock absorbers from Bilstein are our top pick because they improve the performance of your Chevy Silverado without compromising on your comfort especially when traveling on the harsh and difficult terrain. With these shock absorbers in place, you will be able to take charge of every situation and enjoy a controlled, stable, and comfortable ride. The smooth ride will allow your passengers to enjoy a peaceful nap on long drives before you can reach your respective destination. The installation of these shock absorbers is very easy, and you do not need a professional for this. You can install these shock absorbers yourself in a few hours. These shock absorbers will make your cruise in the woods seem as if you were on a flat surface. These Fox 772126F shock absorbers make use of the latest in shock technology to enhance the performance of your Chevy Silverado. The race-proven damping controls form a major component of these shocks thus enabling a predictable off-road handling and comfortable on-road ride even in the most demanding conditions. The cooling capacity is increased with the help of precision impact aluminum body which also makes these shocks rust-proof. The valving technology used in these shocks is guaranteed to provide race-proven performance. The Internal Floating Piston mono-tube design effectively separates the shock oil from the nitrogen-charged gas chamber. This helps the shocks to achieve maximum performance as it eliminates oil aeration. The race developed damping piston together with application specific valving makes the 2.0 Performance series IFP the perfect ride capable of handling the toughest terrains. The smooth body of these shocks provides you with control and enhanced ride quality even on the toughest road conditions. These shocks are able to withstand the most brutal road conditions because of their superior design. The anodized aluminum external reservoirs help increase nitrogen and oil capacity. These shocks not only deliver a striking race look, but their race-proven performance also gives them an edge over other shock absorbers. The adjustable preload ring enables coil-over lift height of up to 2 inches from factory height. These shock absorbers are second on our list due to their advanced technology and outstanding features. The precision aluminum body is rust resistant and increases cooling capacity. These shocks help deliver the optimal spring rate with top quality racing coils. Locking, spring preload rings help achieve easy ride height. The IFP eliminates oil aeration while ensuring easy installation. These shocks bolt on without any modifications thus helping to level your truck front-to-rear. If you want to enjoy highway and off-road driving, then the Bilstein 4600 series is the right shock absorber for your Chevy Silverado. The advanced air suspension technology enhances its damping power and ensures a controlled and safe ride even if a heavy load is attached to the vehicle. These shock absorbers also feature a mono-tube design that prevents oil foaming even at the time of extreme stress. This feature also keeps the shocks fade-free. As these shocks effectively increase the suspension’s capacity, the handling and traction become much better. These shock absorbers are designed with a velocity sensitive, unique, a digressive piston that effectively reacts to changing road conditions. The Bilstein 24-238298 shock absorbers ensure optimal performance as they are tuned for each specific application. These shock absorbers are highly superior in ride quality, comfort, and handling. The Bilstein 4600 series shock absorbers are specifically designed to give your Chevy Silverado increased ride performance and handling while making sure that your comfort is not compromised. These shock absorbers provide superior control as compared to conventional alternatives thus ensuring the safety of your cargo – from your children to work equipment. The superior damping controls allow your Chevy Silverado to glide over all types of terrain while allowing you complete control at all times. The KYB 555055 gas shock absorber has a distinct advantage over the traditional twin-tube design. These shocks can automatically adjust to accommodate even the roughest terrain. 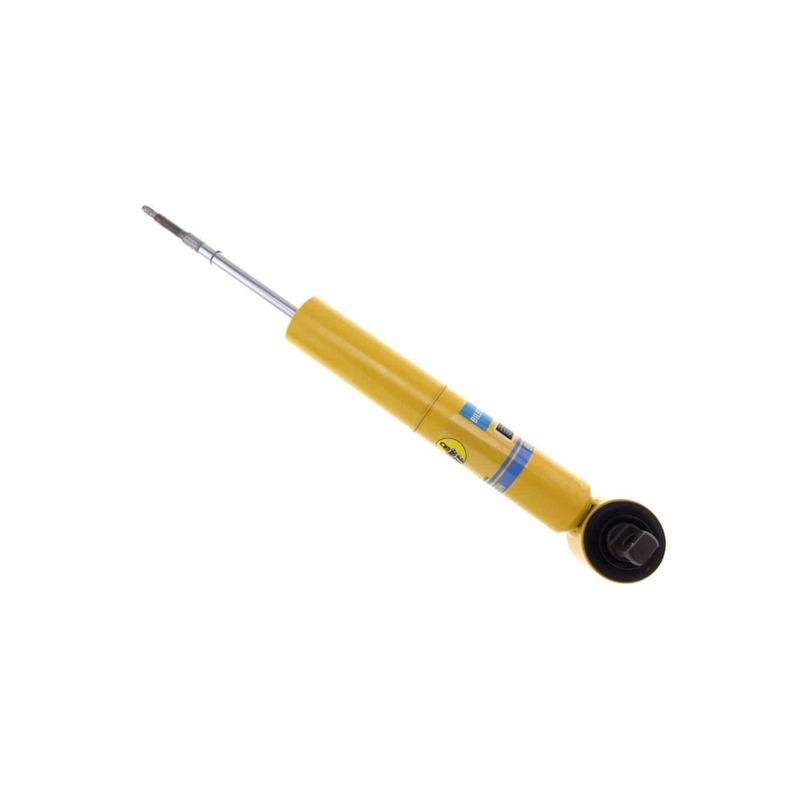 With these shocks, you will never experience fade as a result of aeration. The KYB gas shock absorbers have two separate working chambers – a valve and air-free hydraulic piston for control and responsiveness, and a second high-pressure nitrogen gas chamber with a floating piston that guarantees a comfortable ride at all times. Shock absorbers act as a buffer between your suspension system, the road, and you so that you can have an enjoyable and safe ride. When the vehicle is moving at any speed the springs and tires of that vehicle automatically react to the changes in the road. Shock absorbers, just as their name suggest, compress this change thus making it less abrupt for you in the cabin. A shock absorber is primarily an oil pump installed between the wheels and the body of the car. They are basically used to dampen the bouncing motion of your car when it encounters a bump in the road. They give you more handling and power by making sure that your tires remain in contact with the ground. The basic function of shock absorbers is to provide ride comfort. When you outfit your vehicle with good quality shocks, you will experience a change in the quality of your ride. You will be more comfortable and hardly feel any bumps or potholes in the road especially when you upgrade from OEM to something more high-end. A faulty shock can make your vehicle uneven making it difficult to have a smooth ride over rough terrain. Over time this faulty shock will cause your tires to have strange balding patterns and cause serious damage to your tires. If you do not have good shocks in your vehicle, it can result in inconsistent dampening which in turn will make your vehicle’s handling and control very difficult. When you take a turn, you will notice that the lean of the vehicle is more dramatic. You will also experience a lack of traction when you go over bumps in the road, and it will take more time for the truck suspension to regulate. Faulty shocks can also cause your wheel’s responsiveness to drop. Bad shocks also affect other suspension parts such as coil springs, leaf springs, and traction bars installed in your vehicle. All these different part work together to keep your tires on the ground. By installing high quality shock absorbers, you ensure that all the other suspension parts of your vehicle are in perfect working order. Shocks come in various styles such as gas, automatic, standard, heavy duty, overload, and air shocks. Each style has different advantages and disadvantages, and each one is suitable for different riding conditions. That is why you need to ensure that you choose the type of shock absorbers that are best for your vehicle. Although compatibility and performance are two important qualities to consider before buying any shock absorbers, their price also plays a crucial part in this decision. Always decide beforehand how much you are willing to spend on new shock absorbers and then for the ones that are the best-performing while keeping in your budget. The many different types of available shock absorbers make it difficult to choose the right one, but it is important to buy ones that are compatible with your vehicle. For example, the best type of shock absorber for an off-road truck is the external reservoir shock absorber while mono-tube gas shock absorbers are highly compatible with an off-road truck (raised). It is best to find the shock absorbers that are compatible with your car before making any purchases. It is not feasible to change the shock absorbers of your car after every few thousand miles. Therefore, check the quality of the shock absorbers to make sure that they are made from high quality materials. Shocks are made of different materials the most common being steel and aluminum. Although steel shock absorbers are the cheapest, they can be a little difficult to install. 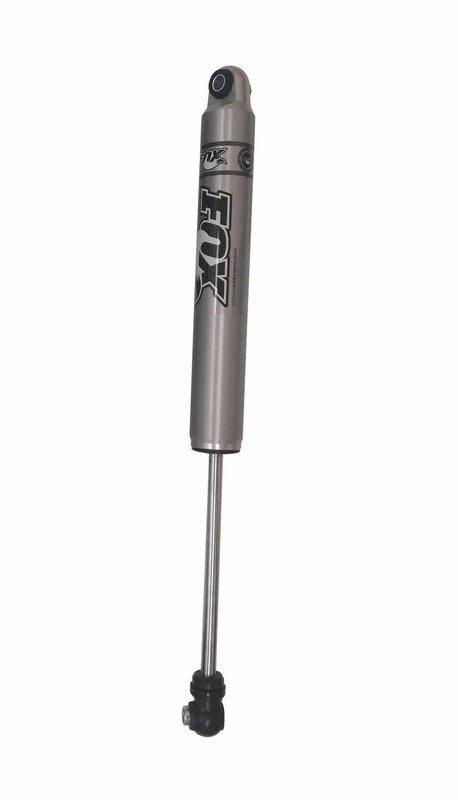 On the other hand, aluminum shocks are lighter and adjustable. These types of shock absorbers are preferred by a large number of drivers but are relatively pricier than other types of shock absorbers. Also, check the construction of the shocks to make sure they are sturdy enough to provide maximum durability. Another deciding factor for a suitable shock absorber is the type of road you will be driving on. For example, an off-road truck will need tougher shocks that will be able to withstand more bounce. The gas and standard shocks originally installed in most cars are ideal for normal driving conditions, but for rough roads full of gravel and muddy roads, heavy-duty shocks are the best. Before buying a shock absorber make sure that they are easy to install and you will have no problem installing these shocks yourself. However, some shocks require modifications or customizations for installations. For such shocks, you will have to engage the services of a professional. Whenever you need to buy shocks make sure that you buy them from an authorized dealer. This will ensure their high quality. Compare prices on the internet so that you can get your required shock absorbers at the best possible price. Proper functioning of shocks is important for your safety, therefore, avoid buying second-hand shock absorbers. It is impossible to predict the number of years your shock absorbers will last. However, it is best to replace them every five years unless your vehicle has been subjected to extreme use. Off-road adventures can cause the shocks to wear out much faster due to the bounce of the car. Road salt and extreme weather can also cause your tires to wear out more quickly. Leakage of oil is another sign that your shocks need to be replaced. Yes, hydraulic fluid can leak out of shocks if the upper seals become brittle or torn. Bad shocks can cause some vibration especially if the mounts are bad. Worn shocks allow the wheel tire combo to bounce and shake, resulting in vibration rapidly. You should buy shocks from an authorized dealer or online from trusted shops. You can also visit the local shops and compare prices before buying anything. Yes, there are some companies which manufacture shock kits which can lift trucks. The shock absorbers do not only cushion the ride they are essential for your safety. They keep the tires and wheels intact and make it very simple for you to maneuver and control the car. Therefore, make sure that you purchase the right shocks for your vehicle. Also replace them immediately if you notice any issue with them.